Ausstellung in New York - atelierzumsteins Webseite! Von Dezember 2014 bis Juni 2016 wurde ein Teil meiner Werke von der Agora Gallery in New York vertreten. Die Agora Gallery ist eine renommierte Galerie im Künstlerquartier von Chelsea, die auf eine 25-jährige Tätigkeit im Kunstmarkt zurückblicken kann. Looking between the bodies and interactions in Helga Zumstein's work, any viewer can rejoice in her coded messages. Her wholly recognizable scenes show with graphic aptitude that art is everywhere, but sometimes it takes an artist to truly capture it. Zumstein, a Swiss national, has made painting her mission and her passion, and she incorporates into her works her experiences and appreciation for artistic institutions such as museums, galleries, and art schools. With great care and a long exposure to the fine arts, she has developed a stoic perspective on the often vague delineations of what art is. 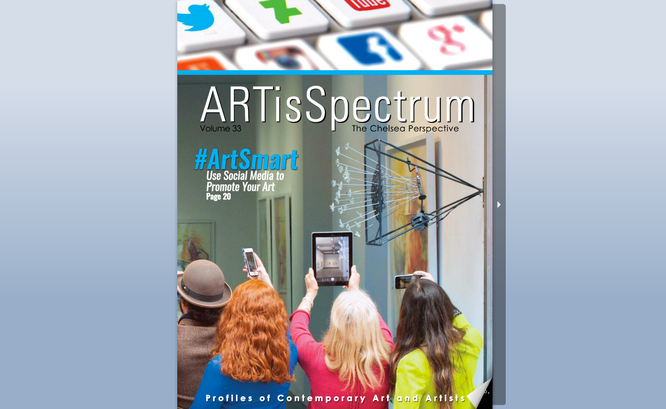 For Zumstein, art is the space beyond the frame as well as the space inside it. In her words, her paintings are meant to "extract the special out of the ordinary; the precious out of the banal." Her gaze focuses on domestic and bucolic scenes, but also highlights and celebrates the artistry of the quotidian life; how in every day and every interaction we turn ourselves and our environment into monuments of self-expression. Although primarily working with traditional media, Zumstein has welcomed various technological developments into her process as a means of playing with realism. The Swiss artist has described her camera as her primary source of inspiration and her "permanent companion," and her work easily draws comparison with the compositional elements of photography. Zumstein, however, strays into the poetic side of realism, using a minimal acrylic palette and taking liberal diversions from her sources of inspiration. Her techniques have allowed her to achieve a refined sense of irony while simultaneously instilling in her paintings a certain quiet dignity. As her focus remains fixed on the living characters that inhabit her paintings, she preserves a striking sense of intimacy that permeates her work. At the forefront of Zumstein's paintings is a sense of spontaneity, movement, and moment, both personal and universal, captured almost as if by chance. It's in this deeply personal manner that she treads the line between self-expression and hints at the inexpressible and the universal. The moments depicted in Zumstein's paintings are moments that could happen to anyone, and the beauty that Zumstein holds up is the type of beauty that goes unnoticed in one's hectic day-to-day life. Rather than treating her figures like still lifes, Zumstein imbues them with a contemplative nature, producing a mirror not just for the artist, but for anyone willing to observe their reflection and smile back. 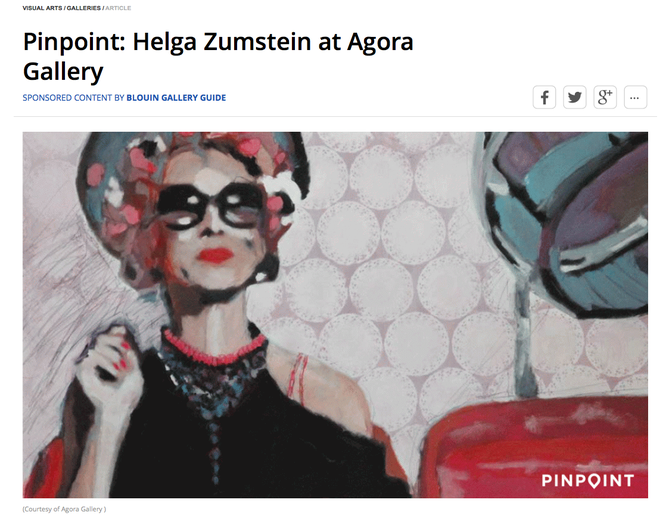 Helga Zumstein will be showing her artwork at Agora Gallery this July, 2015 with an opening reception on July 9th, 2015. "Taken together, Helga Zumstein’s body of work tells the story of a modern city at leisure. Zumstein paints women in salons, pedestrians checking their phones, and tourists taking each others’ pictures in the painter’s equivalent of high definition. The colors are rich but realitistic; the lines are crisp with a cut-out aesthetic. The scenes are relaxed slices of life, and the figures each have complete personalities. The viewer can imagine entire vignettes based on the narratives that Zumstein provides. Zumstein spent several years as a self-taught painter before going to school for both painting and photography, and her work reflects that unique mix of observational skills. She works in acrylic, but with the loose colors and playful brush work of an oil painter. Her subject matter feels instinctive and spontaneous, but her compositions are sophisticated and thoughtful. Each work combines candidness with a wealth of information, resulting in a well-rounded narrative with a resonant, tangible atmosphere. Zumstein was born in Brig-Glis, Switzerland, where she continues to live and maintain a studio today. In addition to painting she is also accomplished in photography and has traveled the world to capture her images."